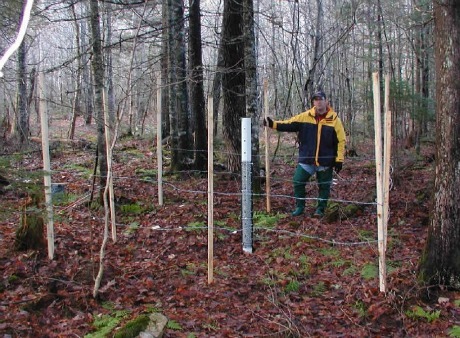 In 2004, in support of a Masters student in Biology at the University of Moncton (Ms. Anne Sophie Bertrand) MREAC staff installed two cougar scent posts. The elusive "Eastern Cougar" was annually seen by Miramichi residents, in some locations more than others. Based on this testimonial evidence, cougar stations (see photo below) were constructed up the Chapel Island Road and on the upper Catamaran Brook watershed. For three years these stations were visited monthly on a year-round basis for maintenance and "refreshing". Throughout this time MREAC staff did not collect any cougar hairs from these traps to indicate visits of passing cougars. From hair analysis and stealth motion sensor cameras, the stations were visited by white tailed deer and bears. Within the last year of the project it was determined that there is not an Eastern Cougar sub-species and that any animals in our region are members of the North American Cougar (Puma concolor). Two areas, as noted, were selected within the Miramichi area and two scent posts were constructed. The scent posts were spiked with imported cougar urine. The traps were designed to collect hair samples left on the barbed wire fence on the rubbing post in the center of the fence in station. Any hairs were then processed by DNA analysis to determine what animal species they were from. While no cougar hairs were found on the Miramichi, they were found at other Atlantic Canada locations during this study.